Scholars have made conflicting claims for Byzantine hospitals as medical institutions and as the forebears of the modern hospital. In this study is the first systematic examination of the evidence of the xenôn texts, or Xenonika, on which all such claims must in part rest. These texts, compiled broadly between the ninth and thirteenth centuries, are also transcribed or edited, with the exception　of the combined texts of Romanos and Theophilos that, the study proposes, were originally a single manual and teaching work for doctors, probably based on xenôn practice. A schema of their combined chapter headings sets out the unified structure of this text. A short handlist briefly describes the principal manuscripts referred to throughout the study. The introduction briefly examines our evidence for the xenônes from the early centuries of the East Roman Empire to the fall of Constantinople in 1453. Chapter 3 examines the texts in xenon medical practice and compares them to some other medical manuals and remedy texts of the Late period and to their structures. The xenôn-ascribed texts are discussed one by one in chapters 4–8; the concluding chapter 9 draw together the common, as well as the divergent, aspects of each text and looks to the comparative evidence for hospital medical practice of the time in the West. 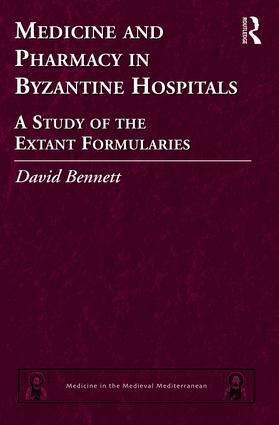 David Bennett was, for most of his career, a hospital executive in the British National Health Service. In retirement, he brought together his life-long love of the Greek language and the interest he had developed in hospital history by studying the texts associated with Byzantine hospitals, first for a Master’s degree and then a Ph.D. at the University of London. He died in 2012. This book grew out of his doctoral thesis. Medicine in the Medieval Mediterranean is a series devoted to all aspects of medicine in the Mediterranean area during the Middle Ages, from the 3rd/4th centuries to the 16th. Though with a focus on Greek medicine, diffused through the whole Mediterranean world and especially developed in Byzantium, it also includes the contributions of the cultures that were present or emerged in the area during the Middle Ages and after, and which interacted with Byzantium: the Latin West and early vernacular languages, the Syrian and Arabic worlds, Armenian, Georgian and Coptic groups, Jewish and Slavic cultures and Turkish peoples, particularly the Ottomans. Medicine is understood in a broad sense: not only medical theory, but also the health conditions of people, nosology and epidemiology, diet and therapy, practice and teaching, doctors and hospitals, the economy of health, and the non-conventional forms of medicine from faith to magic, that is, all the spectrum of activities dealing with human health. The series includes texts and studies. It will bring to light previously unknown, overlooked or poorly known documents interpreted with the most appropriate methods, and publish the results of cutting-edge research, so providing a wide range of scholarly and scientific fields with new data for further explorations.